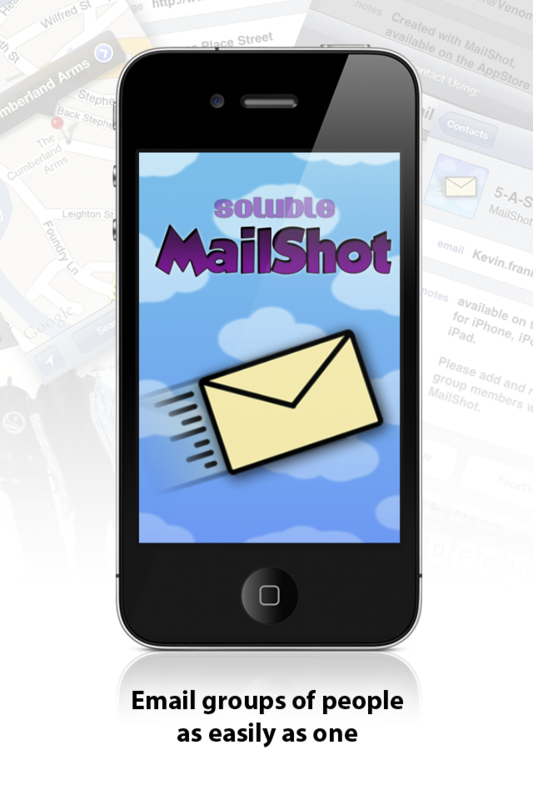 Apple approved “MailShot” last night, and we will be launching to the press next week- Hurrah! It brings email distribution lists to the iPhone, iPod touch and iPad, so that you can easily email a group of friends or work colleagues without having to select them all individually from your contacts each time. Even better, and unique, is that you can do this from pretty much any app on your device that has mail support, including You Tube, Google Maps etc. The first release is going to be free for the first few weeks, and will allow you to create a few groups of up to five contacts. An easy in-app upgrade boosts this to 50 groups of up to 50 contacts, which should be more than enough for most people. You can find it on the App Store from the link on the MailShot page.